Where did it come from? : It’s made by T2 but I bought it from David Jones a few weeks ago after discovering the cool tea shop near my work had suddenly closed. It had been there for ages and I never bought anything there. First time I go to make a purchase and it’s shut up down. Jeez, what are the odds? What’s it like? : Fruity. 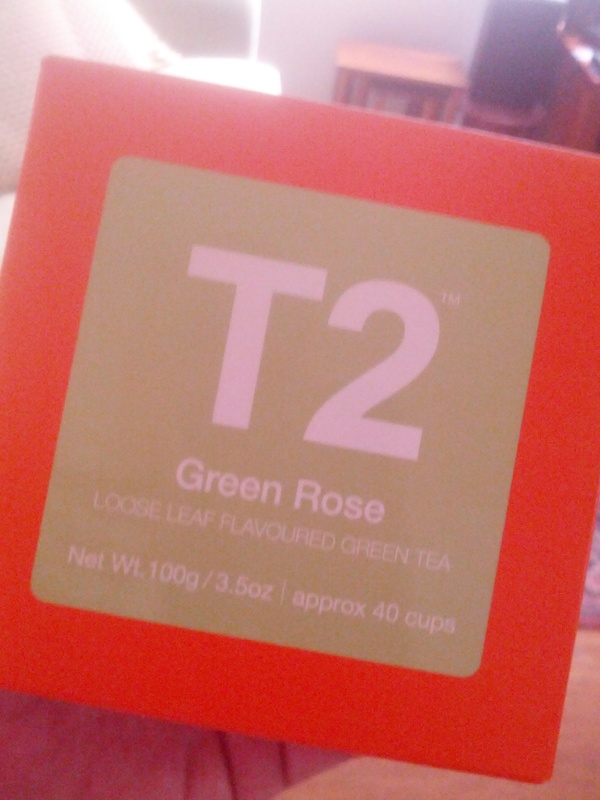 The back of the box says its green tea mixed with rose petals and tropical fruit. There’s also some flecks of blue flowers in there too but the box doesn’t say anything about those. Why do you like it? : I like it because of the aroma. Those tropical fruit notes are really strong. They’re even stronger when I stick my nose into the box of tea. Those characters don’t come through as strongly on the tongue. The fruit is there but it wasn’t strong – kind of like what you’d expect from fruity chewing gum that you’d been chewing on for a little while. Okay, now you can tell the story you think is funny/interesting? : Those fruity notes did resemble beer in a way. In particular I’m thinking of hops – like Galaxy or Citra. Anything else? : This was written a few days ago, back when I was still planning on not drinking for a month. Which would have meant no beer of the week for four weeks. I even planned to do a month of “Tea of the Week”. I’m no longer going dry but I figured I’d already written this, so I’d use it anyway. Incidentally, in the last three or four weeks I’ve gone off drinking coffee in favour of tea. Went from four cups of coffee a day to zero in the space of 24 hours. It was that sudden. What I like about tea is that there are more flavours there. And, no matter how many people banged on about all the flavour notes in good coffee, it always smelled like coffee to me.